recently visited the office of the Coalition for Economic Survival and meet with some of it staff. The workers were soliciting support for their campaign to win a just contract with fair wages and benefits. No doubt, CES provided them with unconditional support. 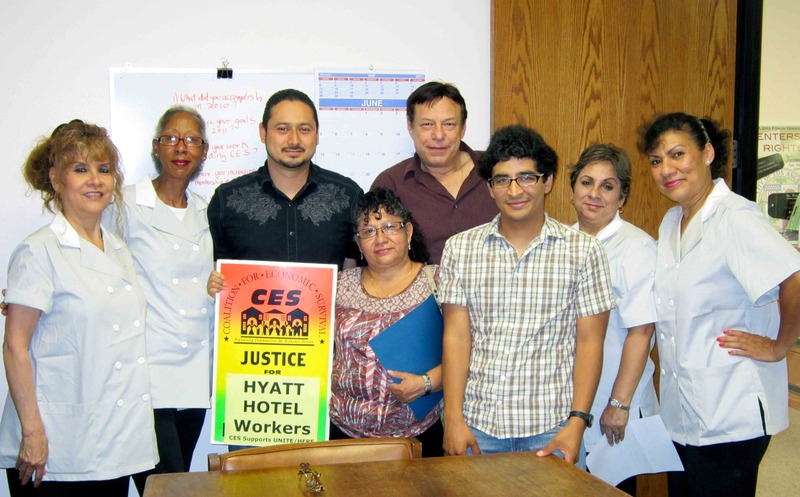 UNITE-HERE has been battling with Hyatt Hotels Corp. over wages and health insurance. The union claims the Hyatt chain is pushing for “recession contracts” that would roll back health benefits and freeze wages, while opposing organizing campaigns at non-union hotels. Since contracts with the Century Plaza and the Andaz West Hollywood hotels – among other Hyatts nationwide – expired in 2009, UNITE-HERE Local 11, which represents Southern California’s unionized hotel workers, has been negotiating new terms for the workers at both hotels. ← Where are the Jobs?? ?